Coade stone was the most famous of all the artificial stones popular at the end of the 18thCentury, because it had a very fine, hard finish, which resisted London 's acid rain and outlived natural stones. The splendid house fronts in Bedford Square, with their decorated keystones, and Classical detailing, are in Coade Stone. Admire the quality next time when you go past on the 73 bus. The stone took some time to set and, before it was dry, the pieces could be taken out of the mould and gently altered so that they were slightly different from each other. A keystone with, for example the face of a bearded man, could be made subtly longer or broader. Walk round Bedford Square and see how the heads change from doorway to doorway. 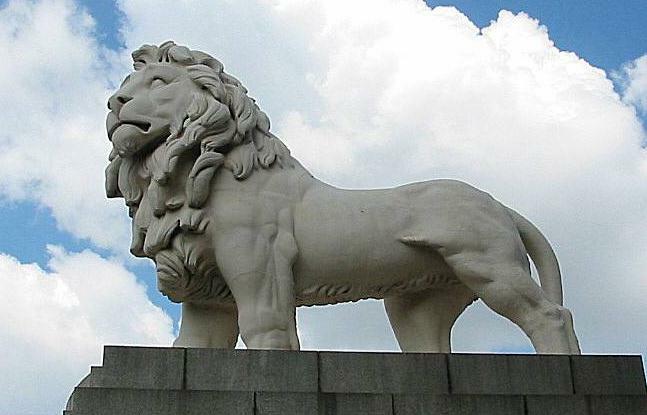 The Truman Lion which now stands proudly on Westminster Bridge is in Coade Stone as are many other well-known statues. Coade stone was the most famous of all the artificial stones popular at the end of the 18thCentury, because it had a very fine, hard finish which resisted London 's acid rain and outlived natural stones. The splendid house fronts in Bedford Square, with their decorated keystones, and Classical detailing, are in Coade Stone. Admire the quality next time when you go past on the 73 bus. Mrs Coade, who ran the firm after her husband died, employed some excellent sculptors when they were young and their prices were low, to make sculptures and bas-reliefs which she copied for years and they are extremely well known. Moulds were made these and used year after year. Whole rows of London houses still bear examples of their work. Before they were quite dry, the pieces could be taken out of the mould and altered gently so that they were slightly different from each other. A keystone with, for example the face of a bearded man, could be made subtly longer or broader. Walk round Bedford Square and see how the keystone heads above the doorways change from house to house. You will see a row of related Greek gods, each slightly different. Then, when the stone had dried out completely, it was put in a furnace and fired. The secret of Coade Stone sculptures, capitals etc., was that they were not concrete but a form of terra-cotta. They do not dry like concrete but are fired like crockery. The stone mix included broken pottery and glass, both of which had already been fired once, so that when it was fired again it shrunk less and gave a very hard material which would outlast stone. The Truman Lion which now stands proudly on Westminster Bridge is in Coade Stone, as are many other well-known statues. 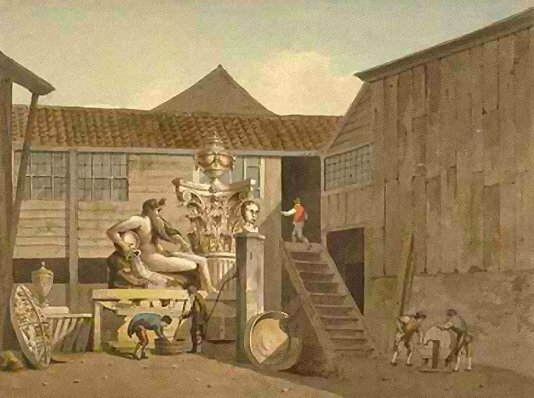 The firm stood in Vauxhall, near the site of the Festival Hall and the bottom millstone, on which all this Coade Stone was ground, now lies under Westminster Bridge, immediately outside the Festival Hall. Take off your hat to that stone. It has done a lot of work. The fact that the rendering and capitals in the Clissold Road houses were in artificial stone which could be compared to Coade Stone, indicates their high quality.